Mit diesem Beispiel kann der Nutzer über die Höhe seines Armes zwischen verschiedenen Bildern auswählen. Ist ein Bild ausgewählt, kann dieses über eine „Wisch-Geste“ groß angezeigt werden. »Kinect SDK« von Microsoft installieren. 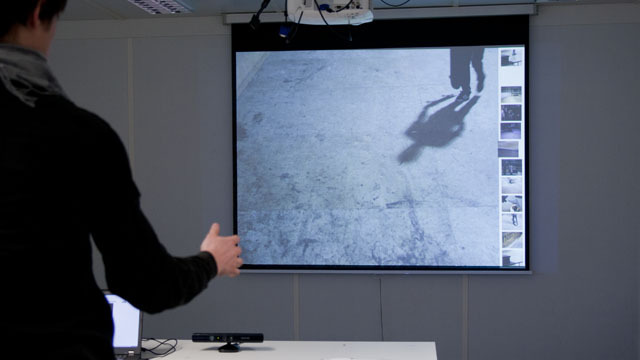 With this example, the position of your arm is used as an input, with the kinect 3D camera. It allows you to select different images with the vertical position of your hand.If a picture selected, a swipe gesture will display the image in full size. To use the kinect on a PC, you’ll have to install the »Microsoft SDK for Kinect« first.